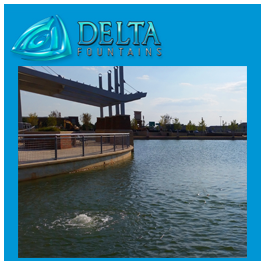 Delta Fountains’ Pond Aeration Systems are a great solution for larger bodies of water where water is stagnant in some or all corners of the pond. They can be used as the only aeration system for a water source or in combination with a floating fountain. We use several aeration system styles, but our most popular is our Pond Aeration Diffuser. The visual display depends on the style, but all our styles are hidden below the water’s surface and cause surface water disruption. For this style, the aeration system piping is hidden below the water’s surface and sends air directly to the diffuser disc below the water’s surface. The disc can be placed wherever aeration is desired in the pond, so long as air can be properly pumped out to the disc. The diffuser disc creates a subtle bubble, or boil, on the water’s surface. The resulting ripples travel outward from the main boil-point, disrupting stagnant areas of the pond. The resulting display is shown below. Too often, ponds and reservoirs are subject to still water, especially in areas with little wind activity and no outlet to larger water sources. When this happens, algae accumulates above and below the water’s surface, causing unsightly buildup. Floating fountains, aeration systems, cannons and blasters all offer aeration and surface disruption to water sources. They can reduce algae levels, increase oxygen levels and provide a large percentage of the required aquatic maintenance. These are all vital to the health of water bodies, especially in mosquito-prone areas.